What a difference a year makes. As I look back on 2008, there are so many firsts in my life and so many things I am thankful for. But no lists today. Instead, on last day of this year, here's another first. I finally dared to make an Indian mithai. Yes, me! To ring out the year in style, here comes rasmalai - my last minute entry to Food in Color - White. Rasmalai has two parts - the chenna balls and the rabdi/milk these balls are soaked in. To make the balls, heat 1/2 litre milk until it comes to a boil. Reduce the heat to a simmer. Add a tsp of lemon juice to the milk and stir until it curdles. Strain to separate the whey. Textbooks say to use a cheesecloth but I've never managed to do it without spilling everything or burning my hand so I just pass it through a large strainer and press down with a plate for the whey to drain away. I am back with this month's edition of "This Book Makes Me Cook". And this month, we are reading the charming "Anne of Green Gables". Anne comes to the green gables house as a scrawny yet lively orphan girl. The brother-sister duo adopting her are at first shocked at getting a girl instead of a boy, but Anne's charm is hard to resist. With her unruly way, Anne commits several blunders but ends up becoming a favorite of whoever she comes in contact with. The book is chockful of food - teas they give and go to, including the one Anne fatefully makes her friend drunk at; as well as pies being baked and dinners being hosted. One of Anne's most spectatular failures was a layer cake, so I set to make a decandent chocolate layer cake for her. All in all, a great Saturday afternoon spent with Harini and Alka. I totally loved Alka's Koki that we devoured on the spot. And let me tell you that I've eaten at least a few thousand calories since last evening, gorging myself silly on Harini's brownies & cakes and the box of Nariyal Barfi Alka packed for me. It was fun, girls! Let's do this again sometime soon. And if you already saw the chessboard cookie pictures over at Harini's and Alka's, let me assure you the recipe's coming soon too. If you are not in India, you have probably never seen a mocktail on a menu. Mixed drinks without any alcohol, mocktails are a must have in a country where so many people stay away from alcohol. My favorite star of the mocktail world is Shirley Temple. Concocted for the teetotaler Ms. Temple, it really is the simplest of mocktails to make. You essentially mix grenadine with a lime-lemon flavored soda. Ginger ale, Sprite, 7 Up all work well here. The fancier versions “build” the drink, meaning you gradually float grenadine on top of soda so you can see two differently colored layers. Others swear by a shot of orange juice to improve the drink. Try it any way you want; for this post is not about Shirley Temple recipes. It's about grenadine. I have been tagged by Sunshinemom and Bharti to bake bread for Breadline Africa, a South Africa based charity organisation that seeks to put a lasting end to poverty in Africa. Their Blogger Bakeoff is an online campaign that challenges bloggers to get involved by baking bread, act by donating to end poverty and then challenge their readers and five other bloggers to do the same. For this bakeoff, I decided to bake the garlic rolls from Nicole's Thanksgiving menu. Easy to make and delicious, the rolls were a sure winner. Isn't this the most poetic of names for this most delicate among beans. Flageolet beans are young kidney beans, dried when they are a very dainty green color. I challenge you to pass by a pack of flageolets without wanting to buy and cook them right away. I know I couldn't; they are so beautiful. This is a bean I wanted to cook without cluttering it with too many spices. And yet I wanted a proper main dish, not a salad. What I did was adapt my fuss-free rajmah recipe to cook flageolet beans. Soak 1/2 cup flageolet beans overnight. Next morning, boil beans in salted water until tender. I used a pressure cooker and it took around 7-8 minutes. Chop one large onion into largish pieces and grind to a paste. Also grind 2 tomatoes to a puree separately. Did you play pacman when you were in school? I think that was the first game I played on a computer and I was hooked. I haven't played Pacman in at least ten years, but I still think fondly of Mr. Pacman and the monsters. Which brings us to these pacman crackers that I first saw on Natasha's blog. I know this was four months back, but I've been thinking of pacman crackers ever since. And finally, I got around to making them too. Just combine 60 gms flour, 30 gms butter, 110 gms shredded cheese (I used Amul, use cheddar if you want a punch), 1/4 tsp pepper and 30 ml water and knead into a dough. Leave in the fridge for half an hour. Roll out the dough. then cut a round cracker and make the pacman's mouth by cutting out a slice using the pointed end of your heart shaped cutter (or a star shaped cutter). Make smaller crackers for pacman to bite into and bake everything in a 200C oven for 15 minutes. I've spent the last hour trying to figure out how sago differs from tapioca. I only know that they are both starches that come from two different plants, but I still don't know whether our sabudana is sago or tapioca pearls. Instead, I am going to tell you my favorite sabudana dishes. The first one's sabudana vadas, the deep fried sago and potato cutlets. But with a few thousand calories each, that's not something I can eat everyday. The other favorite, sabudana khichdi, makes a regular appearance on my breakfast menu. It's a bit tricky making this one so pay attention now. The previous night, wash 1/2 cup sago/tapioca pearls and soak in just enough water to cover them. Any more, and this will not work. By next morning, the pearls will have soaked up all the water and will now be plump and soft. More carbs, naturally! There's something deeply satifying about a piece of bread, or a bowl of rice. Tuscan peasants knew what they were doing when they invented this rustic pasta dish. Traditionally made with pappardelle or tagliatelle alongwith breadcrumbs and walnuts, it's a dish for days when your fridge is empty. I, of course, substituted macaroni for fresh pasta. And brazil nuts for walnuts. So here comes Macaroni with Crumbs and Brazil Nuts, the best new pasta dish I've tried in a while. Boil a cup of macaroni (or spaghetti if you want to be more sensible) in plenty of salted water. Tear 2 slices of white sandwich bread in small pieces, place on a tissue paper and microwave for 30 seconds. The pieces will get soft, but will harden as they cool. Grind to crumbs in a food processor. This rice was cultivated exclusively for emperors of China, and the common men were forbidden to eat it. When I read this on the packet of forbidden rice in New York's Whole Foods, it was incentive enough for me to lug it all the way back to India. The other incentive was it's color - black rice, how could I not try it. Further research told me that while the rice was black raw, it will become a deep purple once cooked. This presented a problem. I couldn't for the life of me figure out what to pair with purple rice. Finally, I decided to cook it like a pulao - sauteed some onions, added rice, salt, black pepper and twice the quantity of water then let the rice simmer for 45 minutes or so till it was done. The flavor was akin to a very fine basmati, but had more bite to it. And I had it with the only white colored pairing I could think of : spiced yogurt. Flash back to that time before deep freezers and shopping malls. Before broccoli, bell peppers and avocados became commonplace in Indian kitchens. When vegetables and fruits meant whatever was grown that season within a few hundred kilometers of wherever you lived. I divide that time by vegetables not seasons. I am pretty sure there was more variety, but after you ruled out the bottle gourds and pumpkins, summer for me was arbi and bhindi. Just like winter was sarson ka saag which I would steadfastly refuse to eat and so only options were matar and gobhi. That's what comes out of being picky when you are growing up. Ask any book lover what their favorite childhood read was, and chances are they would name one of the Enid Blytons. Who can ignore the charms of Noddy, or the very mischevious Famous Five and Secret Seven. Blyton must have written hundreds of books in her time. I still devour all her childhood sagas, and I know a lot of you do as well. For when Bhags first ran "This Book Makes Me Cook" in May, didn't half the participants pick an Enid Blyton as inspiration to cook from. It isn't surprising then that "This Book Makes Me Cook" is reading a Blyton this month. The book we picked was "The Naughtiest Girl in the School", one of the several school series she wrote. With vivid descriptions, the book brings to life a quintessential English boaring school called Whyteleafe. Equally close to life is our heroine Elizabeth, the girl with a heart of gold who's pretending to be naughty. These started off as dill, onion and paneer rolls in Aparna's kitchen a few days back. I loved the interplay of fragrant herbs, paneer and crunchy onions. Plus anything that's a small roll and not a loaf is an instant hit in my view. I didn't have dill when temptation to bake this roll struck me last night, but I had a pack of oregano I didn't have instant use for. This is the only change I made in Aparna's super-easy recipe. Start by adding a tbsp of honey and 1 1/2 tsp yeast to 1/2 cup warm milk. Leave it for 10-15 minutes until the yeast is bubbling. Mix a cup each of plain flour and whole wheat flour with 1 finely chopped onion, 1/2 cup crumbled paneer, 2 tbsp chopped oregano, 1 tbsp oat bran and 1/2 tsp salt. Add the yeast mixture and knead until you get a soft, smooth and elastic dough. Form the dough into a ball and place in an oiled bowl. Cover and allow to rise till double in volume. Beets are one of those super healthy foods your conscience nags you to eat every once in a while. But I don't like beets as it is. Which is why when DK made an exciting version of hummus with beet as part of the recipe marathon in May, I bookmarked it instantly. If only I get back to my bookmarked recipes in time. But even five months later, beet hummus was a delight. The only change I made to DK's recipe was using sesame seeds instead of tahini. And it only takes 5 minutes to make as long as you remember to soak chickpeas and have them boiled and ready. Visibly more colorful, and also more delicious than the regular hummus. I am an instant fan. When I bought this pita bread, I had a bright idea for a new hummus. Then life happened. And I forgot to soak chickpeas. Which means my hummus will have to wait for another day. But in the meanwhile, I have pita in my fridge. And I have a dinner to cook. I also have some peppers and baby corn lying around, which reminds me of my favorite sandwich roll filling. From there, it's a simple matter of putting the two together for "Baby Corn and Peppers in Pita"
I was at first a reluctant convert to avocados. The nutty flavor is very different from anything else I'd tasted and it took some getting used to. Then I fell in love with guacamole. There are as many ways of making guacamole as the number of people who make it. I myself make a mildly spicy dip. But today, I have a salad like version with slightly underripe avocados. Chop one avocado, one small onion, one firm tomato and a few slices of jalepenos into small cubes. Finely chop a few sprigs of coriander (I didn't because I didn't have any). Add as much salt and cayenne pepper as you like and juice of one lemon. Mix. Eat. After three weeks of world cuisine, all I've wanted to eat in the past week is Indian comfort food. Like this Sai Bhaji, the Sindhi combination of lentils and spinach. Start by cleaning a bunch of spinach. Wash spinach, remove any tough stalks and chop the leafs into small bits. Heat a tsp of ghee in a pressure cooker. Drop in 1/2 tsp of cumin seeds and let them sizzle. Add one finely chopped onion and stir fry until it is lightly browned. Add one finely chopped tomato and cook for a couple of minutes. Add add 1/2 tsp of turmeric powder and salt to taste (1/2 tsp does it for me). Drop the palak into the spices and stir for a few second till it wilts. Add 1/3 cup masur dal and 2 cups water. Close your pressure cooker and cook for 3 whistles. Add some garam masala and serve on top of plain rice. And of my other favorite farmers market at New York's Union Square. Plus a snapshot of the foods I brought back from my trip. There are some pictures in the older posts as well if you want to go back and sneak a look! I am at New York's JF Kennedy Airport waiting for my trip to end, and my flight home to take off. For all of last week, I have tried and yet not said anything to you about New York city and its foodscape. For what could I have said....in the past week I had Indian, Thai, Japanese, Mexican, new-age raw vegan, Italian and Turkish food. And I had salads and sandwiches and pizzas from the delis of Times Square. And of course, I had bagels with cream cheese and New Yorkers' favorite eggs & cheese on roll for breakfast. How does one explain this melange, this melting pot of cultures that defines New York city. Every time I come here, I get simply awed by the foods of New York. And every trip I make discoveries new. If you are a New Yorker, stop reading right now. This post is only for tourists, specially the folks crowding the Times Square looking for a bit of Broadway magic. You can obviously capture your Broadway memories at one of the many excellent plays or musicals around where I am right now. But the perfect touristy thing to do will be to head out to Stardust Diner. Stardust is a Broadway parody of American midwest style diners, all chrome tables and faux leather booths. I am sure they have excellent burgers and fries or other diner-like food that I haven't seen as a vegetarian. But despite the awful food, I do end up here one evening every time I come to visit the Big Apple. Two reasons : one, the drinks. They do awesome grown-ups milkshakes that come in a tall metal tumbler. I only always drink malted mudslide and can vouch for it being out of the world. We are having a magical month at This Book Makes Me Cook. September is Harry Potter Special, and we have decided to create a recipe based on our favorite harry potter book. I so completely love the world Rowling has created in her seven books. But the magic starts wearing off just a little bit in her later ones, so I always enjoy the first three books in the series the most. And my top favorite; that has to be the very first one. When a common little boy enters the magic castle and meets the half-giant Hagrid, the old wizard Dumbledore and (my favorite) the sorting hat. Oh! I completely love the first time Diagon Alley opens to show her wares to Harry, that first trip across the barrier to Platform 9 3/4, the first boat ride to the magical world that is Hogwarts. Does it ever happen to you when you go to a new city that you pass by a place you want to go in, think you have enough time later, but never end up coming back that way. Always happens to me. I think I still have another 2-3-5 or whatever number of days, but the end always comes so soon and then I end up having lots of what-ifs, my little bits of unfinished business in the city I might never come back to. Like this small kiosk set up by the french bakery chain Paul in a canary wharf mall. I had a sandwich there, but I was bewitched by their macaroons. It was morning, and too early for the sugar rush so I thought I'd come back in the evening. And every evening I'd get late at work and they would be closed by the time I got there. Now you probably know of Harrods already as the heaven for shoppers. Synonymous with luxury retailing, Harrods can be a bit over the top at time. But there is no doubting that an hour at Harrods can put you in touch with the best any store has to offer anywhere. My favorite part of Harrods is (not suprisingly) their food halls. The confectionary, chocolates, cheeses, caviar and restaurants counters from around the world - I always get lost and end up spending hours there. And then I head up to second floor to a relatively unknown jewel at Harrods. It's called the Chocolate Bar, and the name really says it all this time. You can have a chocolate shot - similiar to espresso but decidely more delicious. Or the long version, which is pure chocolate with cream or milk. My favorite is their big platter of strawberries and mini-marshmallows with a chocolate dip. In true Harrods style, you can have a glass of champagne to go with that. It's now called Med Kitchen. But the oakwood floors are the same. You walk into the hall where Frank Doel came back from his buying trips; to ship Newman's first edition and Latin Vulgate to Helene. And you climb down the solid wood stairs to the cellars (now restrooms) that held long tables with their precious treasures. I was sombre over my starter of olives with Pimms. By the time I finished my entree of Penne Arrabita, I was close to tears. I could not order dessert for the fear I'd burst out crying. For gone are the display windows. And the upstairs room where Helene scooped up the white lettering. Also long gone is the Poole's at 86 where Pat Buckley showed up to get his copy autographed. But how about this Helene - I finally made it! PS: I wrote this in July 2007, but it is such an integral part of my London memories that I just had to post it...If you don't know what I am talking about, go read 84 Charing Cross Road by Helene Hanff! An average Britisher enjoys an elaborate meal of cucumber sandwiches, scones, clotted cream, jam and rich cakes sometime between lunch and dinner. The afternoon tea is more than a meal; its a tradition, the hallmark of British culture and almost sancrosanct. Right? Extremely wrong, as it turns out! Sorry to disappoint all Jane Austen and Wodehouse fans out there, but the English afternoon tea is a fallacy re-created entirely for the gullible tourist. An average Londoner would hop into the nearest cafe and order a cuppa with some finger food just like an average New Yorker would pick up a coffee from Starbucks. That kind of defeats the point. But it's very very nice. Think of it as a warm, gooey, chocolate-y muffin coated with toffee sauce. I don't care much for the clotted cream that it comes with but it helps balance the sweetness. This is from Browns, my lifesaver in Canary Wharf when I am jet lagged and so not up to going to town to eat. It's always Browns or Japanese fast-food chain Wagamama on my first day here. Because I get so little time in the city outside work, these are my London traditions. Little goalposts that define my feel of the city, places I return to on every visit. Oh! I am so looking forward to rediscovering the city. Even though I know my next two weeks in London are going to be cold and cloudy at best; rainy and miserable at worst. Even though london never feels like summer, it feels great to be back! 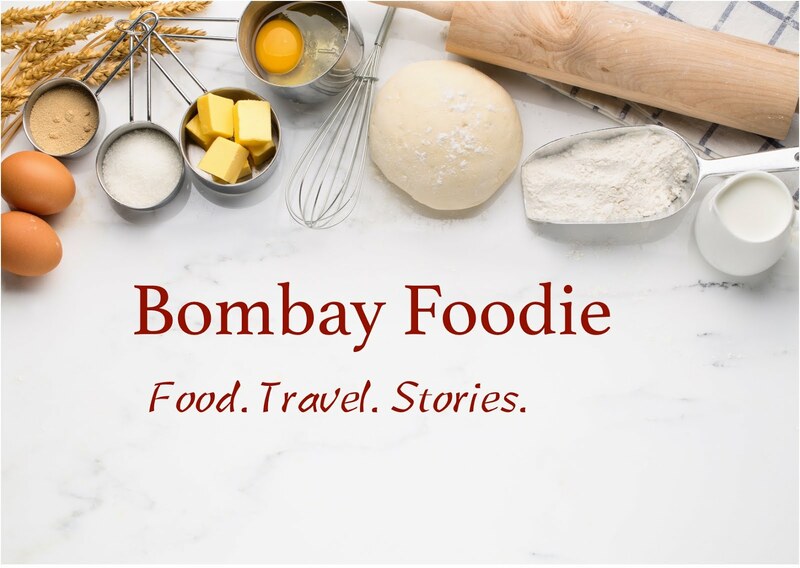 Bombay Foodie is going away. For the next 3 weeks, you are not going to hear from my kitchen. But don't think that lets you off. My trip to London and New York might be work-only, but there will be some sightseeing sneaked in. And there will be food. For isn't that the only sightseeing I ever do : restaurants, grocery stores and farmers markets. Stay tuned for a flavor of London next two weeks, and then some food reports from the Big Apple. I just can't think of what to write today. That's what my absolute favorite meal does to me, I just want to stop talking and dig right in. So I won't ramble and go straight on the recipe for kadhi. First, make the pakoras that would go in the kadhi. Slice an onion lengthwise. Make a batter with 1/2 cup chickpea flour (besan), salt, red chilli powder and water. Dip onions in this batter and deep fry until crisp. Keep aside. This has been a strange year for rains. The monsoons arrived late, threw a few tantrums and then dried up. Now, after a few dry weeks, we are most likely getting the last rains of the year. The only thing I ever feel like eating when it rains are pakoras and chai. Vegetables, most likely onions and potatoes but sometimes paneer, dipped in a gramflour batter and deep fried. Warm and crisp - the most perfect antidote to grey skies there is. There's another reason I'm making paneer pakoras today. We have a family tradition - it's always cakes and paneer pakoras for birthdays. Always, ever since I was a really small kid. You can add to this menu if it's a bigger party, but these two are must have for a very special birthday today. Happy Birthday, Papa! You are the best father in the world. If you were wondering where I went to last weekend (and I know some of you did, since I vanished on our book posting day), I was out on a trip to the Konkan coast. No, not the Goa Konkan. But some truly beautiful, unspoilt, off-the-beaten-track beaches. Some lovely small towns, and a journey through the Ghats. Where the mountains and the sea give you a California-like feel. This is by no means typical Maharashtrian food. But there are bits and pieces you won't see anywhere else. Like the nachani papad. Or the very delicious dal and aloo bhaji. The day started with drumbeats as Mumbai's public societies and countless homes started bringing in Ganesha idols. Ganesha, first among gods and Bombay's favorite, will be worshiped for the next ten days and then immersed in the sea. This is Mumbai's favorite festival, one that whole city celebrates. Most homes would do the visarjan (immersion) tomorrow so today's the day for dinner invitations. And everywhere you go you see modaks, Ganpati's much loved sweet. And since I have three dinner invitations already, Bombay Foodie's celebrating with kheer instead.